Two perpendicular lines are tangential to two identical circles that touch. 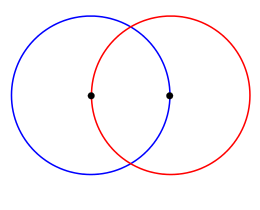 What is the largest circle that can be placed in between the two lines and the two circles and how would you construct it? Two circles of equal size intersect and the centre of each circle is on the circumference of the other. What is the area of the intersection? Now imagine that the diagram represents two spheres of equal volume with the centre of each sphere on the surface of the other. What is the volume of intersection? Sine, cosine, tangent. Circle properties and circle theorems. Pythagoras' theorem. Spheres, cylinders & cones. Volume and capacity. Calculus generally. Regular polygons and circles. Mathematical modelling. 2D shapes and their properties. Biology.